Mama Linda tells Felicia she’ll read her a book if she gets ready for bed quickly, and Mama Nessa promises to join them soon. Felicia decides she doesn’t want her mother to read a book, she wants her to tell a story instead. She has one specific story in mind, her favorite story, a story about being adopted by her moms. Mama Linda tells the story, with plenty of realistic and witty interruptions from Felicia. The reader learns that Mama Linda and Mama Nessa took a plane, not a car or a boat, to Guatemala to adopt their little girl. Newman tells the story with humor and warmth. Romo’s charming illustrations have silly touches, including an out-of-place animal hiding in each frame, which is sure to garner a giggle. A bedtime story is a brilliant vehicle for explaining one type of family formation, in this case, transnational adoption. 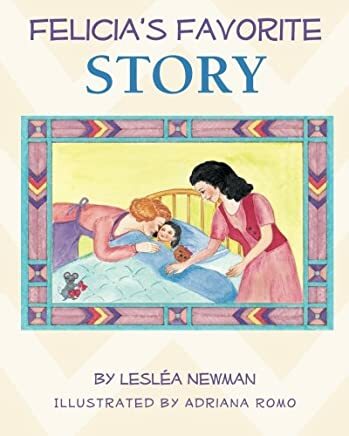 At a time when lesbian parents were nearly invisible in dominant culture, Newman created a beautiful story bathed in a warm glow all families can share as they settle little ones in for the night. Although published over fifteen years ago the text remains current and is readily available for purchase!